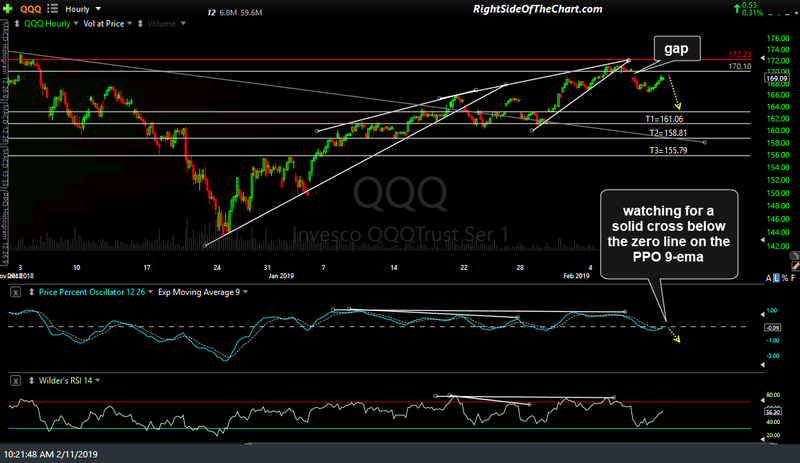 Regarding the QQQ Active Short Swing Trade, the Q’s have gap resistance just above coming in around 170.10 to 170.33 which, ideally, should contain any kickback rally. Reversing & starting another leg down without backfilling Thursday gap would strengthen the near-term bearish case. Should QQQ reverse soon, a bearish cross of the PPO signal line (9-ema) below the zero-line should help to confirm that the Nasdaq 100 is in the early stages of a new short-term downtrend. Are these targets still valid? Although this/that trade hit the official stop & will be updated soon (to be moved to the Completed Trades) I may be adding QQQ back as another short trade soon. While those targets are still potential targets, I would likely revise the first target (at least at this time) to around the 167 level, as that is a minor support level which is likely to produce a reaction on the initial tag from above. Still waiting for some decent evidence of a reversal for now & I’m interested to see how the market closes today.